Figuring out what you want to do with your life is hard. For Danielle Bell and Pablo Osorio — the masterminds behind de Porres, a Brooklyn-born, LA-based dinner series that’s quickly establishing a die-hard following — it took meeting each other to finally crack the code. Now, together, they’ve found a way to combine their eclectic tastes and points of view into a distinctive, ever-changing eating experience that has guests lining up. Most importantly, they finally feel like they’ve arrived in the place they’re supposed to be. The answer snuck up on both her and Osorio after they’d been dating for several months. Although their shared love of food — both cooking it and eating it — was something the couple had bonded over from the beginning, it had never occurred to them to try to make it into something bigger. After awhile, though, it finally dawned on them: the dinner parties they were regularly hosting for friends had become a central part of their life and relationship. It was more than a hobby. The idea for de Porres began to bounce around in their heads. The premise was fairly simple: They would host a monthly dinner series that would allow Osorio to show off his cooking, with his own menus, and on his own terms. With Danielle’s creativity and ingenuity — not to mention her knack for baking — they would create an intimate, restaurant-quality dining experience with all the the energy of the dinner parties they threw for their friends. As with anything, success wasn’t as simple as having an idea and going with it. For one thing, they were in New York City, where spaces big enough to throw dinner parties aren’t easy to come by. Undaunted, when the couple decided to move in together, they made it a priority to find a place where they could host the type of events they were envisioning. Somehow, they pulled it off, and managed to find a spacious apartment in a relatively out-of-the-way section of Brooklyn’s Bed-Stuy neighborhood. “It had this beautiful dining room with pressed-tin ceilings and amazing light,” Bell says. “And was big enough— barely. 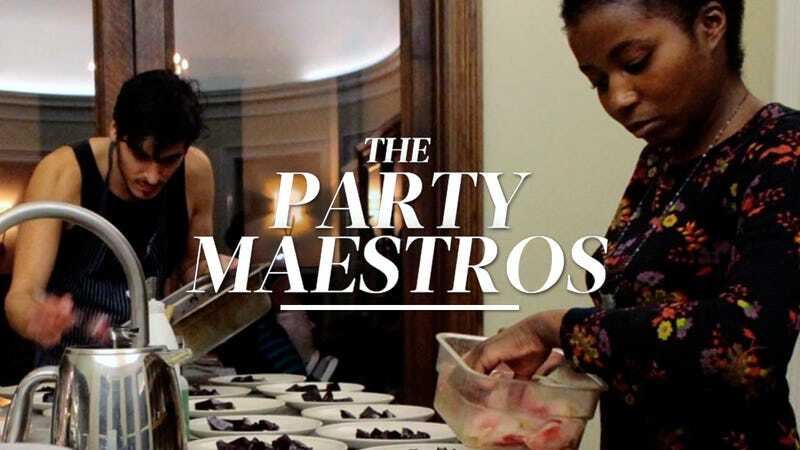 The kitchen was tiny, of course, but I knew Pablo would be able to figure it out.” With that, de Porres, was officially born, with Osorio serving as the chef and Bell managing the guest list, creating the wine and cocktail pairings, and cooking up unfussy desserts inspired by her Louisville background. It’s the kind of headlong leap that the two specialize in, and it wasn’t long before they found themselves packing up their stuff, renting a car, and traveling cross-country to Los Angeles without a concrete plan in mind except that it was time for de Porres to head west. Still, both have the kind of wanderlust that makes them doubt that LA will be a permanent home. Their ultimate plan: bring de Porres back to the hemisphere where it was (kind of) born. “We want to do one in Peru,” Osorio says. “We want to go everywhere,” Bell adds with a laugh. Bennett Madison is the author of September Girls (HarperCollins, 2009) and several other novels.